After the Second World War had come to an end, the British based Orient Line began renewing their fleet that operated between England and Australia. The first of three 28,000-ton liners Orcades entered service in 1948 with the second Oronsay following in 1951 and the third Orsova in 1954. As Australia’s low population left them vulnerable to invasion by the Japanese during World War Two, the Australian government began discussing ways of increasing the population of their country. In the mid 1950s, they began offering to pay for voyages of any Europeans wanting to emigrate. Europeans could then travel half way around the world on a liner at a cost of just £10 to start a new life in Australia. The sudden increase in passengers that followed allowed the Orient Line to order their largest and fastest liner to date. 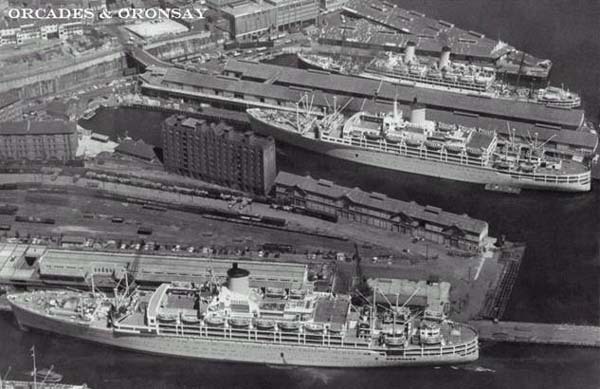 As their new liner Oriana was nearing completion, the Orient and P&O lines joined their passenger ship services. Oriana set out on her maiden voyage from Southampton December 3rd 1960, traveled through the Suez Canal and arrived at Sydney December 30th. With her being the fastest liner operating on that route, she soon cut the traveling time from around 30 to 21 days. P&O’s takeover of the Orient Line in 1965 led to Oriana being painted in the P&O color of white. The ever-decreasing emigration to Australia forced P&O to operate Oriana as a full time cruise ship from 1973. Over the next eight years, she was operated on cruises out of Southampton for nine months of the year and three months from Sydney. Oriana’s final five years as a cruise ship saw her operated year round out of Sydney to islands in the Pacific. Following Oriana being taken out of service in 1986, she was sold to a Japanese company to be used as a museum and hotel at Kyushu Island/Japan. Mounting losses in that venture led to her being sold to a Chinese company in 1999 to serve as a museum at Dalian/China. In 2004, Oriana was damaged in a storm. With repairs proving to be unfeasible, she was towed to the Zhangjiagang Shipyard in China's Eastern Province to be dismantled in 2005. Below, Orcades, Oronsay, and Orsova operated between London and Australia until they were taken out of service and scrapped at Kaohsiung/Taiwan between 1973 and 1975.